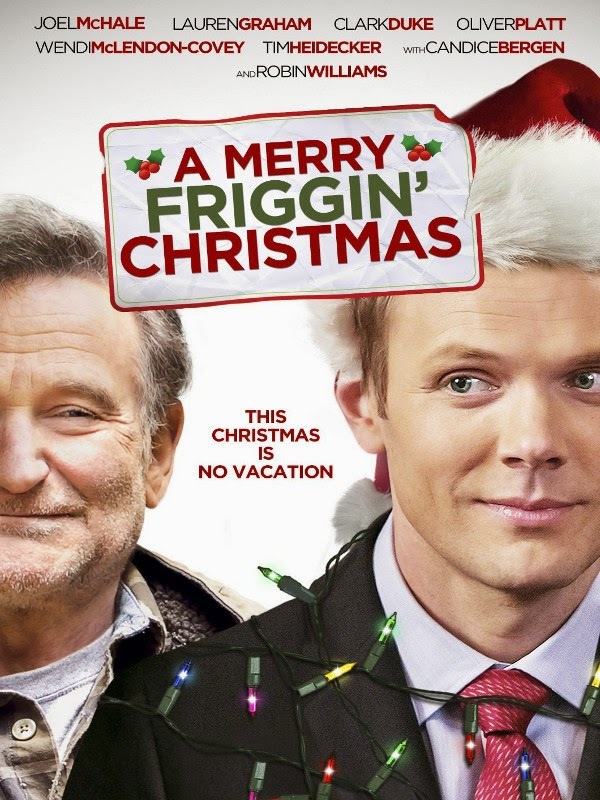 A Merry Friggin' Christmas is a direct-to-video movie starring Robin Williams and Joel McHale. It's one of Williams's last films, which netted it some publicity prior to its release. If you've seen the trailer, you're likely expecting a slapstick comedy in the vein of National Lampoon's Christmas Vacation. That's certainly what I was anticipating, and I hate National Lampoon's Christmas Vacation. If you skim the one-sentence blurbs over on Rotten Tomatoes, you get the sense that's what the reviewers were expecting, too. Those reviews are almost uniformly negative - only 18% Fresh at the moment - and the primary issue seems to be that this movie just wasn't that funny. In my opinion, this is another case of critics missing the point. This wasn't all that funny, because it wasn't slapstick: it was a Christmas dramedy. And I thought it was a pretty decent one. The movie focuses on the relationship between its two leads. Williams and McHale play a father and son with a strained relationship. Circumstances force them together for Christmas. When McHale's character discovers he left his son's presents four hours away, they embark on a road trip to recover the gifts and get them back before Christmas morning. The trailer will throw a dozen zany gags at you. All of these are in the movie, but they represent most of the farcical twists the movie takes. The rest is a surprisingly honest portrayal of anger, frustration, and regret. These aren't exceptionally complex characters, but they feel a hell of a lot more believable than what you usually get from this sub-genre. There was a learning curve to the comedy: until you got used to the tone and characters, the jokes didn't hit. But once I had a feel for the movie, I found myself enjoying it quite a bit. The movie also took some interesting turns with the Santa trope. A large portion of the film is built around maintaining belief in childish things, and it approached the subject far more intelligently than I'd expected. In addition, there were some added layers for adults to dig into. Christmas movies generally portray a setting where Santa Claus clearly exists in broad, unsubtle strokes, then poke holes in the edges for older viewers. This one inverts that dynamic - I'm not sure I've ever seen that done before. In addition, this movie makes good use of B-plots. The film follows three separate story lines: In addition to the leads, the mother and grandmother bond over frank discussions of the past and relationships, and the kids mess with each other and confront the Santa question. The movie introduced numerous elements that should have backfired, but miraculously none of them do. This is far from a perfect movie, and - to be fair to the critics - it could probably have used more humor. But I'd rather a movie with strong characters and mixed comedy than the reverse. Over all, I enjoyed this.